(P1) Look for asparagus that is freshly picked and has a juicy, firm feel. The ends should not be too white and dry. Asparagus with thicker stalks will naturally snap at the woodiest part of the spear. (P2) Young asparagus spears are more tender and don’t need to be snapped before cooking. Simmer in a frying pan of boiling salted water. Check to see if the asparagus is cooked by testing with a knife halfway down the spear. When ready, shake off any water and serve immediately with a knob of butter. (P3) Alternatively, you can blanch your asparagus spears in salted, boiling water for one minute. Remove with tongs and shake off the water. Fry on a hot griddle pan or frying pan in some olive oil until the spears are golden-brown in places. Season with freshly ground black pepper and sea salt flakes. Do you like asparagus? Why or why not? Do you like to cook? Why or why not? What is your favorite cuisine? Why? Which type of asparagus is softer and easier to break? Which other way is given to cook asparagus? 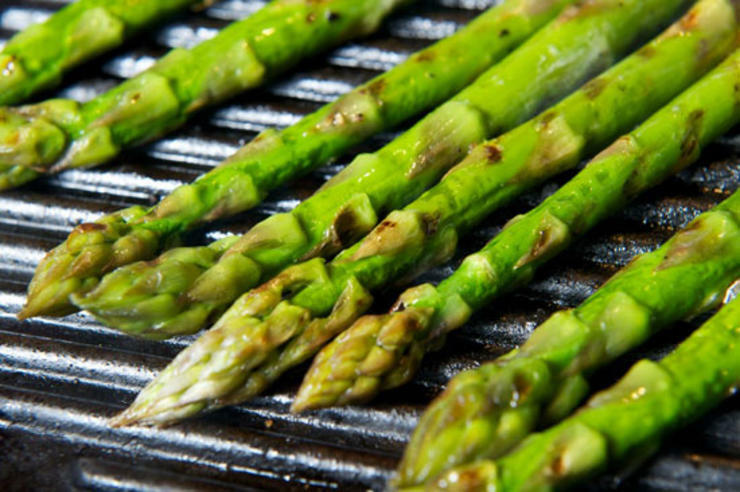 Which spices are recommended to put on the asparagus before eating?